I would like to thank Scott Thomson for supplying me with the relevant literature. A big thanks goes to Jim Owens for providing the photographs of Chelodina oblonga in its natural habitat - Jack Finney lake at the Curtin University, Bentley, WA, Australia. Bradsell, P., Prince, J., Kuchling, G. and Knott, B. 2002. Aggressive interactions between freshwater turtle, Chelodina oblonga, hatchlings and freshwater crayfish, Cherax spp. : implications for the conservation of the critically endangered western swamp turtle, Pseudemydura umbrina: Interactions between turtle hatchlings and crayfish. vol. 29(3):269-275. Burbidge, A. A. 1967. The biology of south-western Australian tortoises. PhD. Thesis. University of Western Australia. Burbidge, A. A., Kirsch, J. and Main, A.R. 1974. Relationships within the Chelidae (Testudines: Pleurodira) of Australia and New Guinea. Copeia 1974:392-409. Cann, J. 1998. Australian Freshwater Turtles. Beumont Publishing, Singapore. pp. 75-80. Chapman, A. and Newbey, K. R. 1995. A biological survey of the Fitzgerald area, Western Australia. CALMScience Supplement 3:1-258. Clay, B.T. 1981. Observations on the breeding biology and behaviour of the long-necked tortoise Chelodina oblonga. Journal of the Royal Society of Western Australia 4:27-32. Davis, J. A., Rosich, R. S., Bradley, J. S., Growns, J. E., Schmidt, L. G., Cheal, F. 1993. Wetlands of the Swan Coastal Plain, Volume 6. Water Authority of Western Australia, WA. Favenc, E. 1888. The History of Australian Exploration from 1788 to 1888, Complied from State Documents, Private Papers and the most authentic sources of information. Issued under the auspices of the Government of the Australian Colonies., Part I, Chapter 2, Sydney: Turner Henderson, 1888. Fox, E. and Mac Shane, M. 2004. Booragoon Lake Reserve Management Plan. Bennett Brook Environmental Services for the City of Melville, WA, Australia. July 2004. Giles, J. 2001. The Impacts of Roads on the Population Dynamics and Ecology of the Oblong Turtle (Chelodina oblonga) at Blue Gum, Booragoon and Piney Lakes. Honours thesis, Murdoch University, WA. Gray, J. E. 1841. A catalogue of the species of reptiles and amphibia hitherto described as inhabiting Australia, with a description of some new species from Western Australia. Appendix E in Grey, G. 1841:422-449. Gray, J. E. 1855. Catalogue of Shield Reptiles in the Collection of the British Museum. Part 1. Testudinata (Tortoises). London: British Museum, 79pp. Gray, J. E. 1856. On some new species of freshwater tortoises from North America, Ceylon and Australia in the collection of the British Museum. Proc. Zool. Soc. Lond. 1855 (23):197-202. Greer, A. E. 2003. Encyclopedia of Australian Reptiles. Australian Museum Online. http://www.amonline.net.au/ Version date: 25 May 2004. Kuchling, G. 1989. Assessment of ovarian follicles and oviducal eggs by ultra-sound scanning in live freshwater turtles, Chelodina oblonga. Herpetologica 45(1):89-94. Lane, J., Jaensch, R., Lynch, R. and Elscot, S. 2001. A Directory of Important Wetlands in Australia, Third Edition. Environment Australia, Canberra. McCutcheon, R. H. J. 1985. 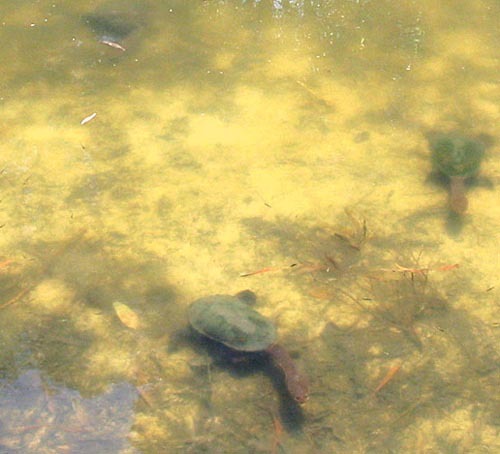 Observations on the breeding of the Oblong Turtle (Chelodina oblonga). The Western Australian Naturalist. Volume 16 No 2/3. Thomson, S. A. and Georges, A. 1996. Neural bones in chelid turtles. Chelonian Conservation and Biology 2:82-86. Thomson, S. A. 2001. The identification of the holotype of Chelodina oblonga (Testudines: Chelidae) with a discussion of taxonomic implications. Chelonian Conservation and Biology. 3(4):745-748. Thomson, S. A. 2004. Personal communication with the author.